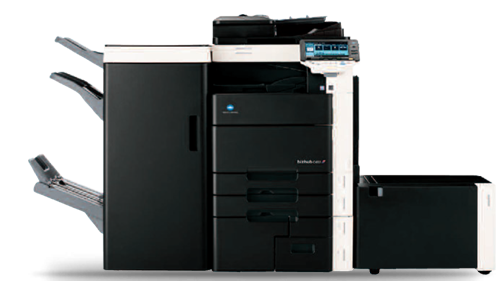 Panama Business Machines offers a complete line of Multifunction Copier/ Printers (MFP’s) from the Small Home Office size units to Large Corporate sized Machines. We offer competitively priced Maintenance agreements to cover every aspect of the equipment. Panama Business Machines, Inc. has been in business 31 years and we have been the Konica Minolta Dealer for 30 years making us the oldest, most experienced dealership in the area. During that time we have received more awards for Service and Sales than any other Dealership in the area. During the 30 years we have been a Konica Minolta Dealer, Konica Minolta has acquired more patents and made more innovations to the copier industry than any other manufacture. In fact if your present MFP isn’t a Konica Minolta product then it does indeed use our technology and some of our previous patents. An App store for and accessible through your copier for downloading productivity based App’s like Legal Scan, Connect to Sharepoint, Google, Paper templates, Stock watch and more. Simply put, Duplex scanning takes Konica Minolta’s already Fastest in the Industry Scan speeds and doubles them. An unbelievable 180 Pages per minute. Allows for printing from any Bluetooth compatible device.